The new NetStax version 4.8 has been tested and is fully compliant with ODVA Conformance Test 15 (CT15) and includes updates and feature enhancements. 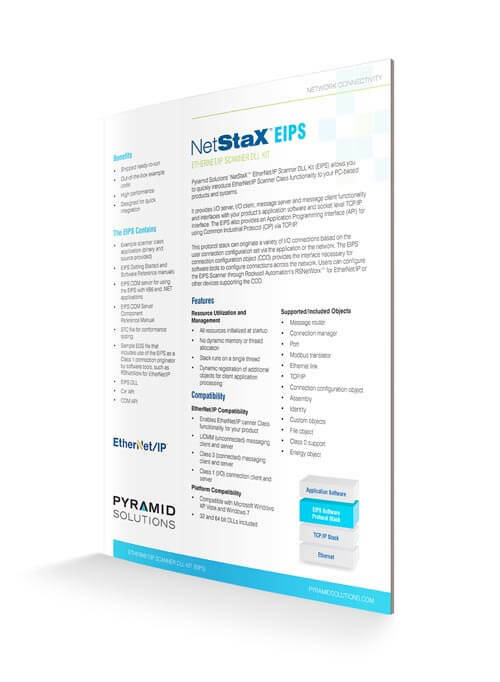 Pyramid Solutions’ NetStaX™ EtherNet/IP™ Scanner DLL Kit (EIPS) allows you to quickly introduce EtherNet/IP Scanner Class (Client/Originator) functionality into your PC/Windows-based applications and products. The EIPS EtherNet/IP Scanner Class software protocol stack provides I/O Server, I/O Client, message server and message client functionality, and an application programming interface (API) for using Common Industrial Protocol (CIP) via TCP/IP. It interfaces with your product’s application software and the standard Windows (Winsock) socket level TCP/IP interface. It also uses standard PC Ethernet ports. 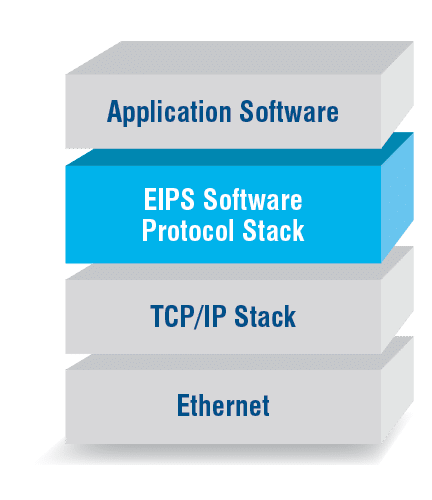 The EIPS protocol stack (packaged in 32 and 64 bit DLLs) is capable of originating a variety of I/O connections based on the user connection configuration set via the application software or from the network. The EIPS Connection Configuration Object (CCO) provides the interface necessary for software tools to configure connections across the network. Users can configure the EIPS Scanner through tools such as Rockwell Automation’s RSNetWorx™ for EtherNet/IP or other tools supporting the CCO.